Infinix announced a new addition to its products but this time its a smart watch, Infinix X-Band (XBO1) First of its Kind Smart Watch from Infinix. According to Infinix, the Infinix X-Band is water resistant and can resist water to a depth of 50m and in addition to that, Infinix XBO1 has Bluetooth receiver as one of its key features; it is also shockproof and vibration resistant. Infinix X-Band comes with a digital display that helps with time and other notifications. 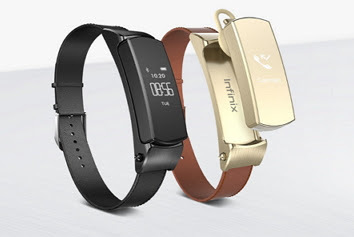 Infinix X-Band however premise a long lasting battery smart-watch that reaches a battery capacity of 100mAh, which is also incorporated with quick charge technology to give you full charge in no time. Interestingly, The Infinix X-Band can easily be synchronized with smartphones and with health monitoring tool; However the price as at the time of filling this report is yet to be revealed.